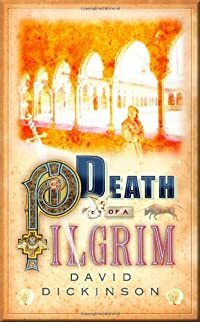 Death of a Pilgrim by David Dickinson, a Mysterious Review. Review: Lord Francis Powerscourt, vacationing in France with his wife Lady Lucy, is called upon to look into the mysterious death of a family member on a pilgrimage to Spain in Death of a Pilgrim, the eighth mystery in this series by David Dickinson. Michael Delaney is one of the richest men in America. But all his wealth hasn't prevented his only son from being stricken with a presumably incurable form of leukemia. The best care money can buy isn't helping. When doctors suggest they do nothing, let Nature take its course, Delaney agrees. Miraculously, his son begins to improve. As a measure of Delaney's gratitude, he agrees to finance a journey from Le Puy-en-Velay in southern France to Santiago de Compostela in northwestern Spain, a historical pilgrimage route dating to the Middle Ages. He intends to invite as many Delaneys as can be found to participate. But the trip starts with a tragedy when John Delaney from England is found dead, possibly an accident, possibly not. The local police intend to investigate thoroughly but Michael Delaney pulls some strings to move things along. Lord Powerscourt happens to be in France and is willing to intervene. The family is allowed to proceed (a contribution or two facilitating the process) but then more Delaneys are killed, some clearly not accidental. It isn't until the family crosses into Spain and enters Pamplona during the festival featuring the running of the bulls that Lord Powerscourt figures out who is targeting the Delaney family and why. Despite the fact that Death of a Pilgrimage takes place along a route between France and Spain, it is at its core a prototypical English country manor mystery. And a very good one at that. The narrative is wonderfully descriptive, meticulously detailed yet not tediously dull. The scenes involving Lord Powerscourt meeting with the official representatives of the French village of Puy-en-Velay are particularly entertaining and illustrative of much of the style of the story. The plot is, admittedly, not terribly original and astute readers will likely identify the culprit long before Lord Powerscourt reveals who it is in a typical drawing room-style denouement, but the thrill here is not in discovering whodunit, or even whydunit, but in the glorious journey itself. Acknowledgment: Soho Press provided an ARC of Death of a Pilgrim for this review.